Bryan Jarboe -- CBU’s Cole Bullard balances baseball and academics to achieve consistant success. Cole Bullard has been a model of consistency on and off the baseball diamond. The senior infielder and catcher for California Baptist University’s baseball team is just the 6th player in program history to eclipse the 200 career-hit mark and is on pace to be the all-time leader in games played. 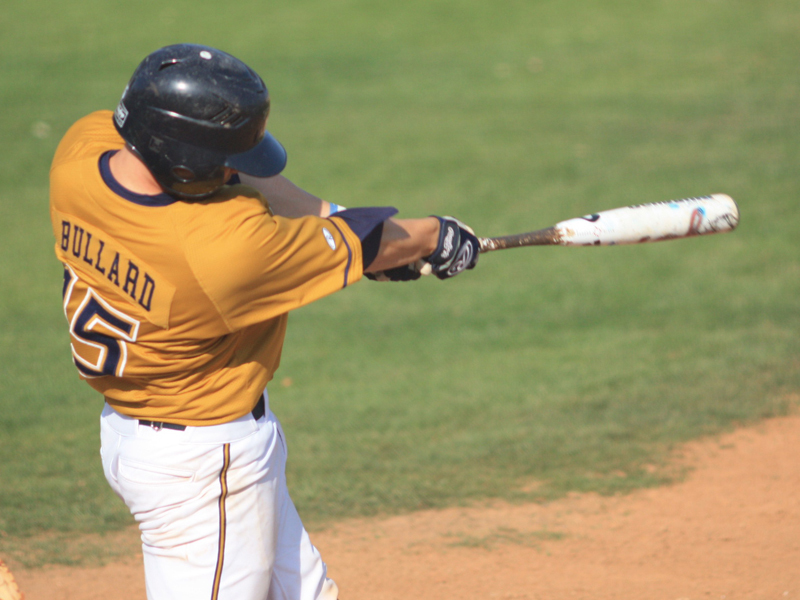 Bullard has been playing baseball since he was five years old and has garnered accolades at every level of the game. He was a two-time All-Valley League player at Vista Del Lago High School and has been named All-GSAC (2009) and a GSAC Gold Glove (2011), as the everyday second-basemen for the Lancers. In his three years with the Lancers, they have been GSAC Champions twice (2010, 2011) and even made an NAIA World Series appearance in 2010. He is near the top in many offensive categories for the Lancers. With a career batting average of .305, he is 6th all-time in hits, 4th in doubles and 4th in stolen bases. But to define Bullard’s career by his statistical accomplishments would not do justice to an individual who has worked tirelessly to improve himself in every area of his life. Bullard has a cumulative GPA of 3.6 and was an NAIA and GSAC scholar athlete in 2011. This excellence in academics is not easy to accomplish for a student-athlete, but Bullard’s ability to develop a routine has enabled him to be consistent in this area. With most days consumed by school and baseball, Bullard still finds time for some of his hobbies — including bowling, playing guitar and hanging out with friends. As is the case for most seniors, his days at CBU are numbered. “My dream or hope is to continue playing baseball after CBU if it’s an option, but I also plan on spending time on the mission field somewhere,” Bullard said. Bullard also admits that he is not ready for the CBU experience to end. “There are so many possibilities, but I’m really just trying to focus on the here and to be over yet,” Bullard said. Part of that CBU experience is the everyday camaraderie and special moments he is able to share with his teammates. “I love the baseball atmosphere. The day-in and day-out grind you go through with the guys makes it so much more special when you succeed together. It means everything to me that I’ve been able to share memories with guys that I’ll be close to for the rest of my life,” Bullard said. There is no doubt that Bullard’s consistent excellence on the field of play will cement his legacy in Lancers’ history. But, in truth, the accolades and statistics speak to the quality of the person behind the jersey.